This unforgettable 9-night adventure offers a dreamy escape from urban life as you head into the luscious jungles and captivating wilderness of Borneo. 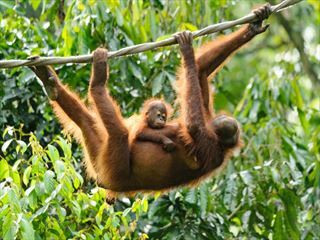 Along the way, you’ll have ample opportunity to behold the region’s incredible wildlife, from guided treks through enchanting, misty rainforests and spectacular UNESCO-Listed national parks, to sailing excursions along serene rivers in search of monkeys, wild orangutans, crocodiles, elephants and exotic bird species. You’ll also observe those learning to live in the wild again within wonderful sanctuaries and rescue centres, including the famous Sepliok Orangutan Sanctuary and Bornean Sun Bear Conservation. You’ll have the chance to explore so many aspects of Borneo throughout this tour; take a glimpse into the local traditions and culture of indigenous villages nestled into the countryside, and soak up the bustling atmosphere of riverside markets and modern city life in Kota Kinabalu. After six phenomenal days of exploring, we think the perfect way to round off your trip is with two days spent on the serene, picturesque archipelago of Manukan Island, where you can spend as much time as you like relaxing on the beaches and snorkelling the clear, tropical waters teeming with exotic marine life and breath-taking coral reefs (INT). Upon arrival at the airport, take a scheduled complimentary transfer to your hotel in Kota Kinabalu. If you have any free time before your 6pm welcome meeting, you may like to spend some time exploring this intriguing city situated between the Borneo Jungle and South China Sea. Having recovered from WW2 bombings, the city is a vibrant and modern metropolis, and the Sabah State Museum is a great spot to learn about its backstory (entrance fee not included). 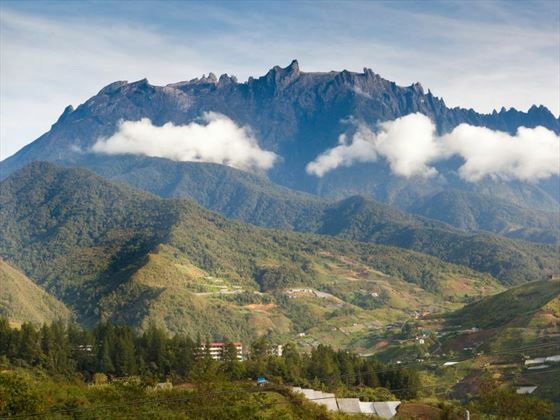 Leaving the city behind, you’ll take a three-hour journey towards the unspoiled wilderness of World Heritage-Listed Mt Kinabalu National Park, stopping off en-route at a local home in Dusun Village for a delicious home-cooked lunch. Upon arrival, you’ll take a guided walk of the lower trails, and enjoy some time at leisure exploring the stunning mountain scenery of the National Park. There are lots of picturesque walking trails offering abundant bird watching opportunities, whilst the Mountain Botanic Garden offers an excellent showcase of the mountain’s diverse plant life, with flora found all around the park replanted here. In the late afternoon, you’ll travel via private bus to Sabah Tea Plantation, taking around 30 minutes, where you will stay for the night in a lush tea garden. After breakfast, you’ll take a tour of the tea factory ending with the chance to sample some of the delicious varieties. 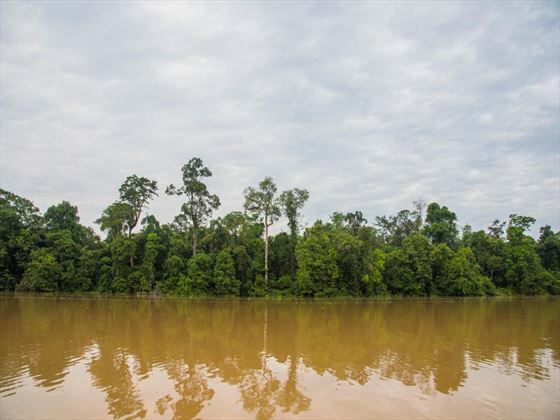 From here, you’ll take a 5-hour private minivan transfer to Kinabatangan River – the second longest river in Malaysia and a protected forest reserve, containing one of Borneo’s highest concentrations of wildlife. In the late afternoon, you’ll take a lovely river cruise with the chance to spot some of the exotic local creatures including crocodiles, macaques, wild orangutan, proboscis monkeys, elephants, hornbills and kingfishers. 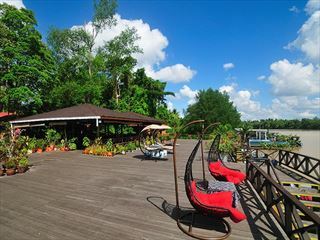 Your accommodation for the night is a jungle lodge located by the river, which is ideal for taking in the lush surrounds. This morning, take a serene cruise down the river to search for more incredible wildlife. Later on, you can take a trek up to a birdwatching tower overlooking the river, followed by a visit to a Merabu tree. This evening’s river cruise will be your last opportunity to photograph and soak up your surrounds. After breakfast, you will take a private minivan transfer to Sandakan, stopping off at the intricate Gomantong Caves and historic Sandakan War Memorial along the way. Sandakan was once the capital of British North Borneo, offering a traditional Cantonese influence in the local cuisine, Chinese temples and lively harbour-side market. This morning, you will take a one-hour private transfer to the Sepliok Orangutan Sanctuary, which was set up to help reintroduce these wonderful creatures back into the wild after a life of domestication or having been orphaned. 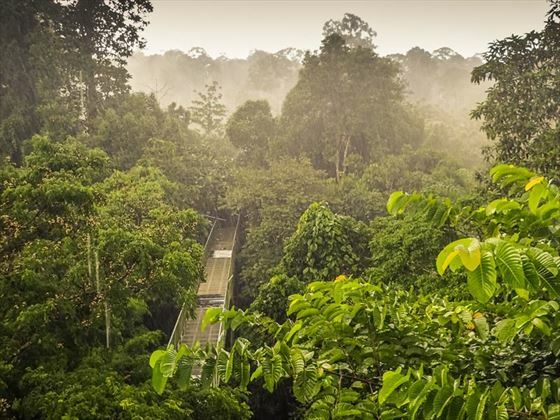 From the viewing platform, you can watch and photograph the Orangutans in their habitat, but human contact must be kept to a minimum and it’s essential you follow the instructions of the park. 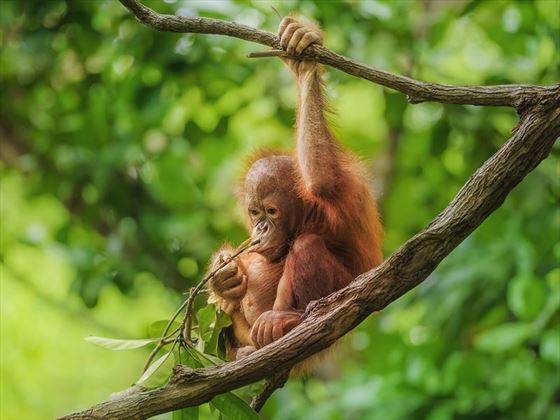 There’s also a nursery where you can watch young orangutans as they learn how to climb on a specially-constructed jungle gym through a one-way glass window. 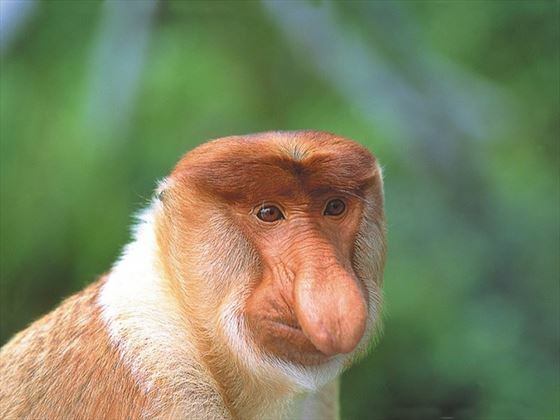 To see more of Borneo’s creatures, you will also visit the Labuk Bay Proboscis Monkey Sanctuary, and you may pay an optional visit to the Bornean Sun Bear Conservation Centre, where rescued sun bears who have been mistreated for many years are cared for, with hopes of rehabilitation and reintroduction into the wild. Alternatively, you can visit the Sepilok Rainforest Discovery Centre to learn about the unique flora and diversity of the region. Transfer to Sandakan Airport today for a flight to Kota Kinabalu. 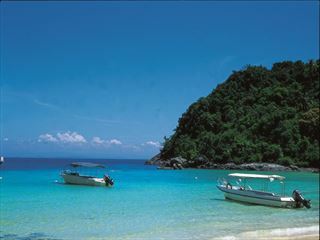 From here, a short 20-minute boat ride takes you to Manukan Island, one of the larger islands found in the Tunku Abdul Rahman Marine National Park. Spend the rest of the day at leisure on the island, perhaps enjoying a spot swimming, snorkelling and an abundance of local activities. We recommend taking a stroll along the picturesque beach, which is particularly lovely at a low tide. Today you will enjoy a snorkelling trip, where you will discover an array of vibrant coral and tropical marine life. If you’re looking for a more immersive experience, you may enjoy an optional scuba diving trip off the island (additional cost). After snorkelling, the afternoon is yours to enjoy – spend some time soaking up the turquoise waters as you stroll or swim around this gorgeous corner of the world. Head back to Kota Kinabalu today via boat and minivan, taking around 40 minutes. The rest of the day is at leisure – you may wish to enjoy an optional fascinating visit to the Mari Mari Cultural Village, nestled deep into the countryside. Here, you will see how indigenous ethnic groups of Borneo used to live. Alternatively, you could visit the Sabah Museum to learn about Sabah’s past, or do some last minute souvenir shopping at the Filipino market. Tonight, you could perhaps head out for a final meal with your group to celebrate your Borneo adventure. There are no activities planned for today, so you may spend time at leisure before heading to the airport in time for your scheduled flight.